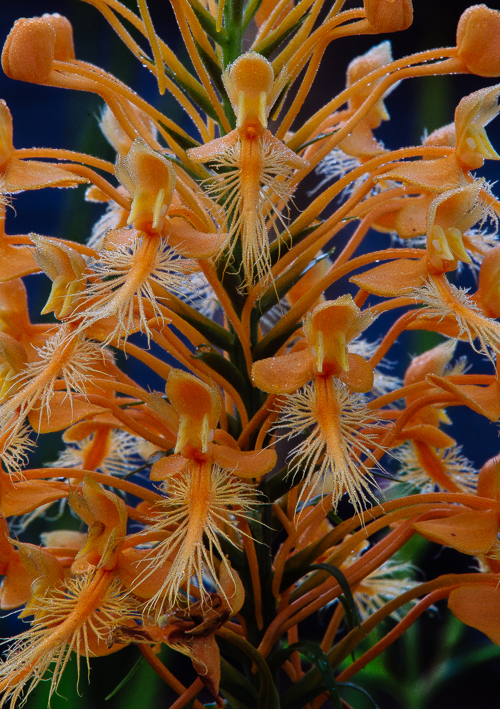 It might surprise you to learn how widespread this spectacular orchid is. 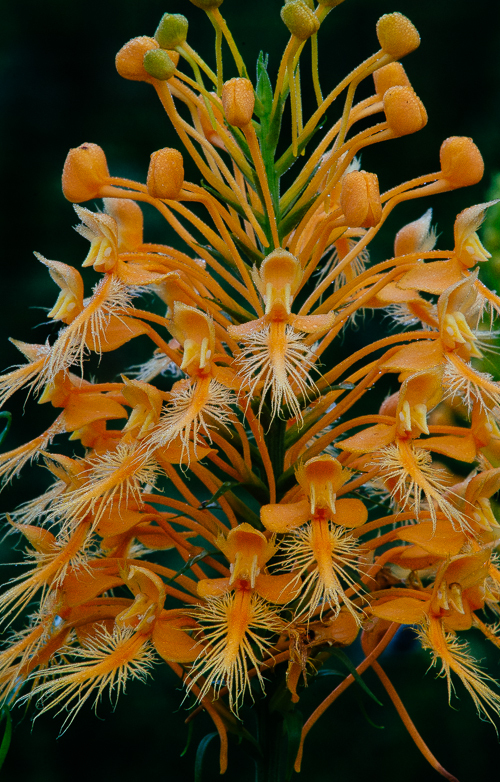 The range of Yellow Fringed Orchid (Platanthera ciliaris) occupies nearly the entire eastern half of North America. But it is limited to wetland habitats, a potential Achilles' heel, since these habitats have been shrinking in percent area, especially during the last fifty years. Platanthera ciliaris, with its spectacularly fringed lip and long spur, is familiar to many residents on the US east coast. In the southeastern states it grows in acidic soils in longleaf pine savannahs, wet open meadows, forests, seepage slopes and road edges. In the northern part of its range it grows in bogs and wetlands. Like many wetland species, it depends on fire to maintain an open canopy. Platanthera ciliaris is pollinated by large butterflies, especially swallowtails, who feed on nectar at the bottom of the flower's spur. When a butterfly probes for nectar with its long tongue, the viscidium of the pollinarium is stuck to the insect's compound eye. A few fascinating studies have found evidence for different pollination ecotypes in Yellow Fringed Orchid. An ecotype is a locally adapted population that is genetically different from other populations. The studies found that in the mountains, the short-tongued butterfly, Papilio troilus, was the predominant and most effective pollinator; and in the coastal plain, the long-tongued Papilio palamedes was the predominant, but less effective pollinator. The coastal plain butterflies were less effective pollinators because their longer tongues kept their bodies at a distance from the pollinarium. The research suggested that the long-tongued coastal plain butterflies were exerting selection pressure for longer spurs on the coastal plain populations of Platanthera ciliaris. ABG's Conservation Coordinator, Matt Richards, says that Platanthera ciliaris is easy to germinate in the lab, fast growing and produces vigorous seedlings. Some of the plants that Matt produced are in the nursery and are flowering now.